Marking the start of the American Birkebeiner Ski Race, we are pleased to present the final edit of "Salomon" the latest in motion from JC|P. The "Birkie," the largest cross country ski marathon in North America officially kicks off today. Celebrating 39 years, the race features a variety of course lengths with the longest race at 54 kilometers. Many of you will be ensconced in the fast action of the Birkebeiner race, but we hope you will take a few moments to view our take on the classic winter sport featuring skate skier Karl Herber donning the latest gear and apparel from Salomon kindly provided by Gear West. Thanks go out to Elemental Motion Media for their work on the edit, sound, grading, and graphics. Without further ado, let's ski! Nordic or "cross country" skiing is a sport many enjoy amid the winter season in this part of the U.S. It's no surprise we have one of the largest ski races happening just a few hours east of Minneapolis. The annual Birkebeiner ski race kicks off next week and seemed the perfect time to debut the still imagery from our latest motion production. This project is an homage to the Salomon brand and their line of cross country skis, boots, and apparel. With origins in France, Francois Salomon started the company by opening a wood saw workshop in 1947, making ski edges in downtown Annecy, France. With over 50 years of innovation behind the brand, Salomon products have extended their reach well beyond France and Europe with products currently available in over 160 countries. Shot nearly one year ago on the heels of the final snowfall of the spring of 2011, we didn't have to travel far for our production. Minneapolis based Theodore Wirth Park provided the perfect backdrop and terrain for our well seasoned model / skier. Karl Herber a veteran skate ski racer and former "Birkie" participant was the logical choice to glide across the freshly groomed, corduroy patterned snow. His expertise along with the latest in Salomon ski equipment and apparel, generously provided by Gear West, assured a professional and accurate portrayal of the beauty and ruggedness of this winter sport. For the better part of the morning we crafted our skiing scenes, filming a variety of angles and ideas. Our skier was great to work with taking on the hills, flats, and curves all along the circuit loop. 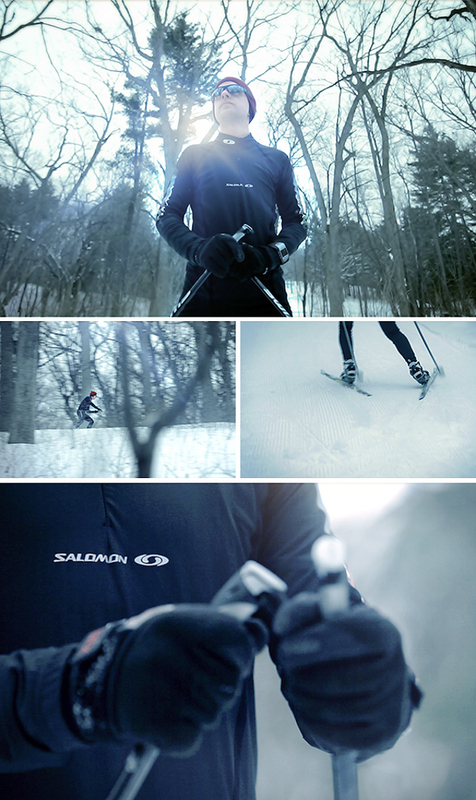 We hope you enjoy these stills as a preview of next week's Salomon motion launch to coincide with the 39th annual Birkebeiner race. Following up on the previous post featuring the still imagery shot for XtremeMac, the final two motion edits are now complete. Thanks to our DP Alex Horner as well as Elemental Motion Media for their work on the audio, editing, and motion graphics.